It has been said that all artists are telling the same story over and over again. This rings true for me - I feel most of my work has been a process of telling my story, piecing it together. My work incorporates appliqué, quilting, collage, painted fabrics and photography and refers to the varied landscapes I’ve lived in. We absorb the atmosphere and energy of a place we live in. When we leave, a trace of ourselves is left behind and an imprint of that place is carried within us. My work frequently deals with issues of displacement and belonging. I am tracing a sense of place, exploring the internal landscape in my textiles. My quilts mirror back to me what I need to know and explore. 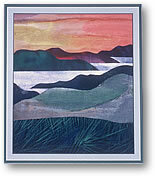 For almost 25 years I have been drawn to the lyrical composition of landscapes. I especially enjoy making them very small - vast vistas within a tiny frame. I use a free form collage approach where the fabric suggests the design. I choose lustrous silk and cotton and iridescent taffeta as my pallet. This series was inspired by a gift of an old ‘Ndebele tribal skirt from South Africa. It stirred me up, spoke to me and sparked a desire to translate the skirt into my own language of symbols and colours. I recently spent 7 years in Newfoundland. I found myself deeply affected by this rugged, foggy, and dramatically beautiful North Atlantic island. I chose the house icon to explore the meaning of personal connection to the landscape. The house symbolizes a container of experiences. These quilts are as much about inner landscape as geography. These concerns stir deep within my own history of uprooting from my homeland of South Africa. Copyright 2004 - 20010. Valerie Hearder. All rights reserved.